PS4 version reviewed. 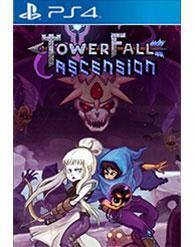 'TowerFall Ascension' is also available on the PC. 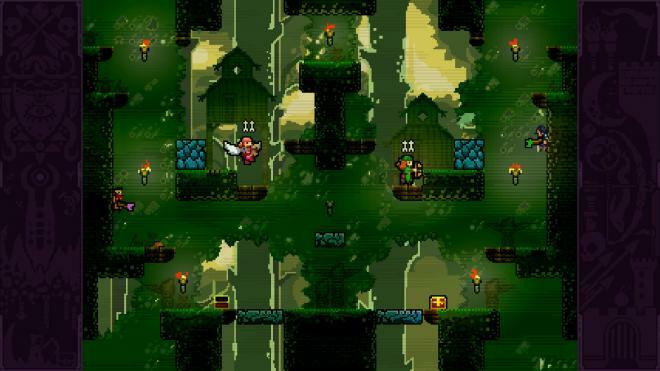 The Ouya killer app 'TowerFall' has proven its mettle in the minors and wants to go up against the big boys. The upgraded 'TowerFall Ascension' graces the PS4 and PC with its 4-player, twitchy, arena combat and offers a bevy of additions over the original version. Arrows and head stomps are on the menu in a feast of quick and untimely death. As is the case with many combat-focused multiplayer games, what might seem basic could also have depth. It's all about the friends you have and what the game does with those snappy mechanics that makes a game a party. At this point it seems we can thank the Android-powered Ouya microconsole for exactly two things: the first and last crowd-funded Android-powered microconsole, and 'TowerFall.' Like an all-star athlete forced through one year of college before making the big leagues, 'TowerFall' has graduated to the Playstation 4, subtitle and all. I never played the title on the Ouya, so I can't quite imagine the immaculate relief a person might've felt having finally found a game to justify the original purchase. I will, however, assume that the hype around 'TowerFall' is, in part, due to that relief. The other part, of course, is that it is in fact a good game. But how good does it look now, on the Playstation Store? Well, it looks like an Ouya game, but it plays like a game, game. 'TowerFall Ascension' is no high art, it ascends no boundaries any game hasn't already sought for itself, and it certainly doesn't reach any new heights on the video or audio front. But it's fun, undeniably unfiltered fun, which is where that whole game thing comes in. Up to four players, if the PS4 owner has the hardware, can sit down and duke it out in a wildly simplified arena battle of arrows and head stomps. Those being the only two ways one can score a kill, it might seem at first glance that 'TowerFall's' greatest asset is also its greatest weakness. Surprise. It is. On just a two dimensional plane, with jumping, wall-bouncing mechanics perfectly tuned, anybody who's ever touched a controller will find comfort as one of the bouncy little archers. They feel good, the shooting works well (with a little player magnetism added to the arrows as a handicap), and outsmarting your opponent with such limited tools compares in satisfaction to puppies fighting over the same treat every afternoon. The rounds are short, the stakes and prize are always the same, but it's in the momentary scurry for victory from which elation arises. You might feint an arrow shot while secretly planning a headstomp. You might utilize a stage's Asteroid's-like border loop to open up a new opportunity. The chaos of twitch decision making might simply devolve into a point scored in pure luck. With limited arrows, which can be collected right off the wall after they're shot, there's a small aspect of resource management to the proceedings. Dodging with the trigger allows you to catch a would-be fatal arrow, but it also has a nasty recovery rate that leaves you vulnerable. Here's the thing. Puppies can do the same thing over and over again. They're stupid and they get a treat in the end. My time with 'TowerFall Ascension' was entertaining, but it wasn't even remotely fulfilling. There's no depth to it, no layers to peel back. You hop around, firing off arrows at lightning speed and trying to outwit your opponents from one moment to the next, but eventually you'll realize that you're only thinking around yourself and not the potential possibilities engrained in the mechanics of the game. There simply isn't enough potential. The argument against this point of view is found in the variants. Setting up a multiplayer match, you're given the opportunity to screw with the formula in a grand number of ways. Slow down time, choose which of the few powerups either spawn with the player or show up in randomized treasure chests over the course of a round. Arrow types offer the most intriguing twists. Bramble arrows plant fatal brush upon a platform impacted by your shot. Bouncy arrows do the obvious. Feather arrows and lighting arrows are more fatal in their own special ways. All these things can be mixed and matched to basically recreate the simplistic scenario and provide new opportunities for quick kills. But even then, the sheen wore off quickly for me. Turns out, a new coat of paint on an old car doesn't make it run any differently. Most fighting games broaden depth through unique characters. That isn't the case here. All the archers act exactly the same. I won't fault the title for choosing this approach, as it enables a controlled environment for well-tuned and satisfying gameplay. That's the result, but it's also flippant. When everybody has exactly the same toolset, the finite number of outcomes that can happen in any fighting game is shrunken exponentially. On the other hand, half of the game isn't even a fighting game. In its transition from 'TowerFall' on Ouya to 'TowerFall Ascension' on PC and PS4, a cooperative campaign magically arose. Without a plot, these 'Quests,' in which enemies are spawned in waves over time in one set stage, aren't as pointless as they first seem. I'm not going to label them as "training" for the multiplayer, because, frankly, beyond the base mechanics the Quests play absolutely nothing like the arena combat. No single enemy is complex, but different enemies together result in relatively complex scenarios. Happily unforgiving, death resets the entire quest. Reaching a late wave with a buddy, losing, and then planning out a safer plan to victory was strategic and tactical; two things I'd never attribute to the multiplayer. The Trials, on the other hand, were present in the original game and fully explain the need for a new campaign. As target tests with a time incentive, they couldn't be more boring. Luckily, they aren't even in the center of the primary menu. Even the developer doesn't think we should see it. As an Ouya game, the retro-happy visuals of 'TowerFall' were endearing in the vacancy of better processing power. As a PC and PS4 title, it stands up against other console retro themed games as a meek interpretation of the glorious old days. It simply does nothing with nostalgia or 8-bit sensibilities that wasn't already done before the SNES bit the dust. Though I fall under the belief that pixel-nostalgia is completely played out, 'TowerFall' doesn't even try to make an argument that there's more to it. Still, the action is perfectly clear, a paramount necessity to the fast pace, and the characters can be described as cute without the sarcasm. That said, aside from the color and generally squishiness, the sprites reflect none of the personality in the representative art in the character-select screen. Some jaunty medieval-sounding tunes spice up the combat nicely. There's nothing like putting an arrow through your buddy to the chimes of epic adventure. On the sound-effects side of things, the game isn't so spicy as it is pragmatic. Sounds signal arrows, death and dodges, often in a single swing. Other than that, the game is light on personality. I'm going to split the difference between the fact that this is a multiplayer game, so replay value comes stock, but it's a shallow one with very little in the way of unlockable or incentive. It's as replayable as your friends are willing, and there's bound to be a more interesting title on the horizon. Unlockable characters are dug deep into the campaign. They're tough to find, but only offer a palette swap once found. Before putting the ribbon on things, there's a question of value on the table. Without online multiplayer of any sort, every PS4 owner with but one controller will be spending quite a bit of money to enjoy the majority of 'TowerFall Ascension's' value. 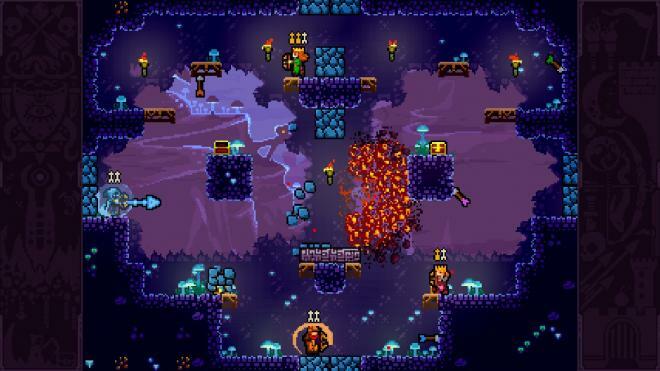 Two controllers nets you the best of the Quest mode, while four controllers (and three willing friends) nets you the best of the multiplayer offerings. With one controller, you're basically a crab at a seahorse party. Make of that what you will. More importantly, the game itself is underwhelming. Yes, there is immediate satisfaction in the mechanics. And yes, the many small variants will encourage continued play among enthusiastic groups of friends. The interplay just isn't as engaging to me as fighting games with disparate characters and a broader sense of variability. That's a knock on this timidly emerging subgenre of twitch-focused arena combat games in general, and it's also a knock on the core design of 'TowerFall Ascension.' It's fun for a bit, and then boring forever.